Start off your visit on the 4th (Mon): look for gifts at With Sugar and then meet the residents at Wildlife Habitat Port Douglas. Get ready for a full day of sightseeing on the next day: get interesting insight from Tours. To see where to stay and tourist information, read our Port Douglas road trip planner . Sydney to Port Douglas is an approximately 7-hour combination of flight and shuttle. You can also drive; or do a combination of train and bus. Expect somewhat warmer temperatures when traveling from Sydney in March; daily highs in Port Douglas reach 36°C and lows reach 27°C. Cap off your sightseeing on the 6th (Wed) early enough to travel to Cape Tribulation. Kick off your visit on the 7th (Thu): take a peaceful walk through Daintree Rainforest - Cooper Creek Wilderness, get great views at Walu Wugirriga Lookout, and then admire the sheer force of Alexandra Bay Waterfall. Get ready for a full day of sightseeing on the next day: enjoy the sand and surf at Cape Tribulation Beach, then stroll through Myall Beach, and then enjoy the sand and surf at Thornton Beach. To find traveler tips, other places to visit, and more tourist information, read our Cape Tribulation trip planner . Traveling by combination of car and ferry from Port Douglas to Cape Tribulation takes 2 hours. Alternatively, you can take a bus. March in Cape Tribulation sees daily highs of 36°C and lows of 27°C at night. Finish your sightseeing early on the 8th (Fri) so you can take a bus to Cairns. Spend the 9th (Sat) among aquatic life with a scuba or snorkeling tour. Spend the 11th (Mon) wandering through the wild on a nature and wildlife tour. There's still lots to do: trek along Esplanade Boardwalk, have fun at Esplanade Lagoon Pool, and take in nature's colorful creations at Botanical Gardens. Take a bus from Cape Tribulation to Cairns in 3.5 hours. Alternatively, you can drive. In March in Cairns, expect temperatures between 36°C during the day and 27°C at night. Cap off your sightseeing on the 11th (Mon) early enough to travel to Airlie Beach. On the 12th (Tue), take a tour by water with Boat Tours & Water Sports. On the next day, see some colorful creatures with a scuba or snorkeling tour. To see other places to visit, ratings, reviews, and more tourist information, go to the Airlie Beach trip maker . Traveling by combination of flight and ferry from Cairns to Airlie Beach takes 5 hours. Alternatively, you can do a combination of flight and bus; or drive. In March, plan for daily highs up to 33°C, and evening lows to 28°C. Finish your sightseeing early on the 13th (Wed) so you can travel to Brisbane. When in Brisbane, make a side trip to see Warner Bros. Movie World in Oxenford, approximately 1h 20 min away. Next up on the itinerary: let the kids burn off some steam at South Bank Parklands, get great views at Mount Coot-tha Lookout, admire the natural beauty at City Botanic Gardens, and look for all kinds of wild species at Lone Pine Koala Sanctuary. 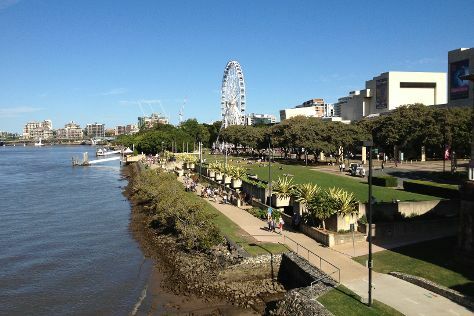 To find where to stay, traveler tips, reviews, and tourist information, read our Brisbane online trip itinerary builder . Traveling by combination of bus and flight from Airlie Beach to Brisbane takes 5 hours. Alternatively, you can do a combination of ferry and flight; or drive. Traveling from Airlie Beach in March, plan for little chillier nights in Brisbane, with lows around 23°C. Wrap up your sightseeing on the 16th (Sat) early enough to travel back home.